Collegium Musicale has two concerts in the festival Wratislavia Cantans in Poland. On 11th September the concert will take place in Wroclav and on 12th of September in Klodsko. Also, Estonian composers Erkki-Sven Tüür and Tõnu Kõrvits will participate in the concert of Wroclaw. The concert is part of Estonia’s Independence Centenary celebrations programme. Estonia, like Poland, celebrates the centenary of independence this year. At Wratislavia Cantans, we celebrate this joyful anniversary with a joint performance of the Estonian choir Collegium Musicale and the Polish NFM Leopoldinum Orchestra. The choir, though young, has already won numerous awards, including ‘the choir of the year’ at the beginning of its activity, and its founder Endrik Üksvärav – the title of ‘young conductor of the year’. The performances of these two ensembles will feature works by contemporary composers from both countries. Wide Waters is the first series of choral songs based on folk songs in the oeuvre of Henryk Mikołaj Górecki. The composer drew texts and melodies from beautifully illustrated children’s books by Jadwiga Gorzechowska (Wide Water) and Jadwiga Gorzechowska and Maria Kaczurbina (As it used to be in the Kurpie region). Górecki gently coloured the original melodies and emphasized their character full of nostalgia and melancholy. Impressive and graceful, Three Pieces in Old Style is a much earlier cycle, from the early – avant-garde – years of the composer. In 1963, his friend, the then head of PWM Edition, accused his compositions of a lack of melodies. Górecki proved that he could compose pieces with a clear melodic line and vivid rhythm, writing three tasteful stylizations of Renaissance music. The first work is a subtle, lyrical piece that captivates with the beauty of the sound. The second is a folk dance based on rhythmic ostinato. Whereas in the third piece, which is- the climax, Górecki came near the kind of expression known from his serial compositions. The motet by Paweł Szymański, In Paradisum, also refers to early music by using the vocal genre especially popular in the Middle Ages and Renaissance. The piece brought Szymański the main prize of the International Competition of Polish Music in 1995. In Stabat Mater, the composer Tõnu Kõrvits combined the famous Latin text with the motifs of Estonian folk music. He wrote a work about the Mother of God full of spiritual distress at the cross in the Oriental-sounding scale from the south-east of Estonia, to be found in traditional songs on sorrowful themes. Erkki-Sven Tüür is a living Estonian legend. We will listen to his Igavik (Eternity) – a work dedicated to the memory of Lennart Meri, a writer and politician, the first president of Estonia after regaining independence in the early 1990s. Meri’s personal history depicts the difficult fortunes of the country in the 20th century: he was a son of a diplomat and studied in foreign schools until the annexation of Estonia by the USSR and deportation of the whole family to Siberia, where, at the age of twelve, he worked as a logger. After returning to the country, he studied history, but he was not allowed to work in the profession; he was also denied a passport for years. Thanks to his literary talent, he gained international recognition, which he used in his activities for the benefit of his homeland. In the end, he became president of the free country and held this position for two terms. The second work by Tüür is dedicated to the memory of the Estonian conductor Peeter Lilje. Dedication of his works to extraordinary characters is part of Tüür’s compositional assumptions, as he wants his works to pose existential questions. He also wants to stimulate the creativity of listeners. Not without significance for the character of Tüür’s compositions are his musical beginnings – he began his career as a leader of a progressive rock band. This festival concert will be a great opportunity to get to know the fascinating culture of the Baltic country and to look at the various faces of contemporary music drawing inspiration from old art and folk creations. 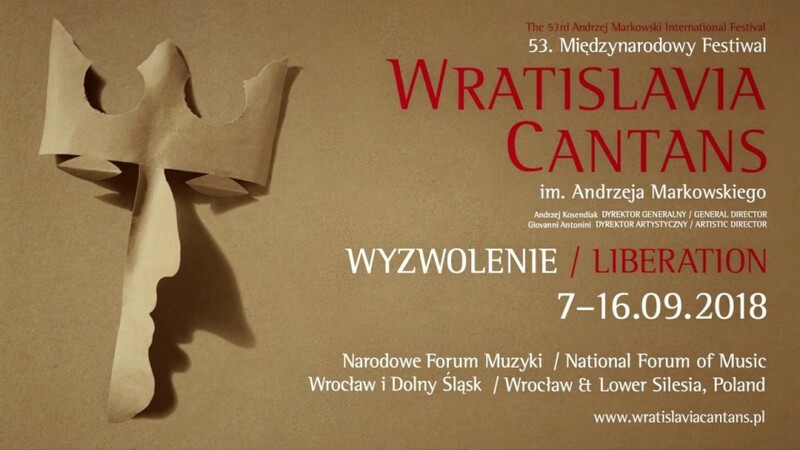 The International Festival Wratislavia Cantans in one of the most important European events in the field of classical music. It was founded in 1966 by Andrzej Markowski. The general director of the Festival is Andrzej Kosendiak, and the artistic director is Giovanni Antonini.